I am a bit of a healthfood nut, and I get a kick out of packing mine and my kids diet full of fruit and veg (but, don’t get me wrong, my kids and I can also be found at McDonalds!). I was recently sent some organic baobab powder, which is an exotic fruit grown on baobab trees in Ghana, Africa. It’s been eaten by African people for centuries due to the fact it is bursting with essential nutrients and antioxidants. I have a few friends who don’t and can’t drink alcohol, and when I recently threw a BBQ party, I was concious that they might be wanting to drink something a little fancier than water! That’s where my pouch of very versatile Pandavita Baobab came in very handy! Baobab contains 20x more antioxidants than green tea and more than blueberries & pomegranates combined. Baobab contains 6x more vitamin C than oranges. Baobab contains more fibre than fruits such as apples, peaches and apricots. This is a great alternative to plain water, and can be whipped up in seconds, with the fruit you have in your fridge. Here’s the full recipe. Whether you’re attempting to lose weight or you just want to look and feel healthier, one of the finest ways to rid your body of harmful toxins is to drink water. Only 6 to 8 glasses each day will keep you hydrated and keep your body at its best possible health. If you love green smoothies, this one is packed with essential nutrients, that will help you jumpstart your mornings, and energise you in the afternoon slump. It looks great served in a short glass with a stick of celery and an umbrella. Here’s the full recipe. Baobab fruit powder has immense nutritious properties. It’s a wonder for your digestion and a rich source of vitamin C which provides you with natural energy; this makes it perfect for livening your body and mind up and to keep you from feeling tired during the day. This is a delicious juice that the whole family will enjoy. Here’s the full recipe. 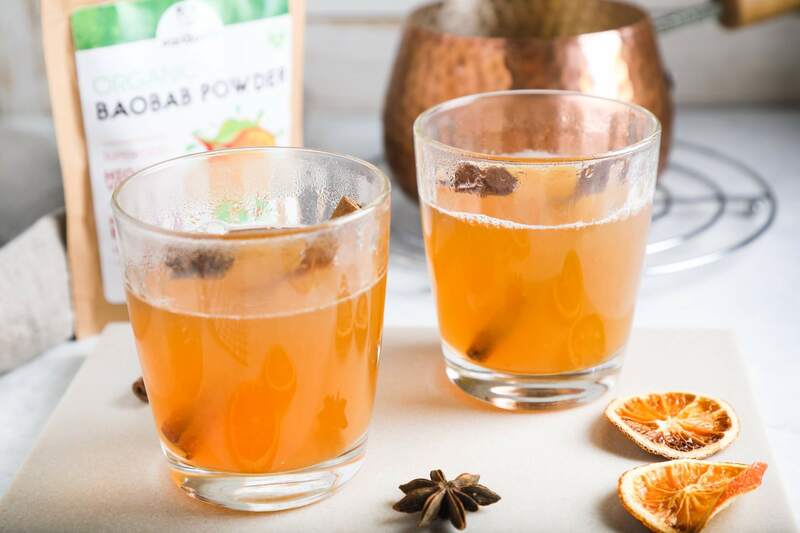 This vegan-friendly, baobab fruit-packed mulled wine recipe will be heaven for your taste buds. This is a great alternative to mulled wine on a chilly evening, or when the sun has gone down on your party. You can even pack it into a flask and take it to the beach to watch the sunset! Here’s the full recipe. Your guests needn’t know that you’ve packed their drink full of corguette and kale, but they’ll be thanking you for it when they feel the benefits. This drink is also great as a weight-loss aid, more on that here. Packed full of blueberries and baobab powder, this smoothie contains a ton of antioxidants which will benefit your body. This is my absolute favourite! Here’s the full recipe. Kids love slushies, right? Ditch the ones that are absolutely packed with sugar, and try these instead. They are sweet and delicious, and are so, so good for you! Here’s the full recipe.